“You can fool some people sometimes. But you can’t fool all the people all the time”, sang Bob Marley. And in the end the truth will emerge. Yesterday, after two press conferences which should tell every valencianista where the problems are, it has been laid naked. To discuss whether Cesare Prandelli might be a coward for leaving the club at such a sensitive time is irrelevant. Anil Murthy and García Pitarch did everything to paint him as a selfish coward today, and although some partly believe them, they are really revealing themselves. Several Twitter polls even before the Prandelli presser gave numbers such as 95% for Suso to resign. Himself he claims to have offered his, but will now stay because Lay Hoon said so. Or was it Peter Lim, who he said he didn’t but did talk to? It’s hard to tell now, as Peter Lim and Lay Hoon according to Suso is a Siamese hydra who made their mark at the press conference by their/hers/his/its absence. To analyze all the contradictory statements from Suso is an exercise I’ll abstain from. It is enough to conclude that where Lay Hoon and Peter Lim are one body , to quote Suso, he himself seem to lack one, as demonstrated by the empty chair next to Prandelli. With Voro being appointed as an interim coach for as long as he’d like (which is not at all, according to himself a few months back), and with no candidates on his note pad, Suso can now finally catch up on his skiing he has so dearly missed the last couple of days. For the good of the club, apparently. And while sliding down the slopes of Sierra Nevada or Val de Linares, he can relax having learned his lesson; to not hire a renowned and experienced coach who are insolent enough to disagree. Irony and sarcasm aside, what was most revealing was the manner which Prandelli left, and his parting words. What perhaps stood out the most was his verdict of Lim’s Valencia being run by number crunchers without feelings or knowledge of football. It’s not news to us, of course. But it’s the first time an established coach has said so after Lim acquired the club. After all, Prandelli’s predecessors were all friends. He also had a subtle message to fans and press; the squad is young, and are afraid of stepping onto their own grass. For that he specifically asked for experienced leaders, and requested at least four of them, and if Suso is to be believed (perhaps the only truth he told today), without naming specific players. Suso excused himself that there weren’t money for more than one, and that Prandelli had to choose between Zaza and a midfielder. One might wonder how all those lesser clubs, like city rival Levante, have built balanced, experienced and competitive squads with empty hands. From outsiders I constantly hear that Valencia’s fans are too demanding, and partly they have a point. It might be about time to reassess the cult in the club about using old stars as inspiration and symbols. With such a young squad, is it really confidence building to be reminded every day that you’re not good enough until you’ve won titles like their predecessors, something infinitely harder to accomplish today than it was a decade ago? Are the orange press and Mestalla crowd asking too much? Maybe. But glancing at the performances of Sevilla and Atletico Madrid, both clubs that Valencia easily can be compared with, in the last few seasons tells you it’s more than possible. Instead, Valencia’s insecure youngsters must enter 2017 facing a relegation battle it is ill suited for. With Prandelli went the long term project option, and it seemed obvious when the news broke of the Italian’s departure that the club would choose a dull, short term old school fireman to replace him, in order to save the spot in Primera. But now it has become clear neither has been chosen, as revealed by Pitarch like it was a point in his favour. There’s no plan, and there’s no plan to make one either. Perhaps a fitting allegory for Mr. Lim would be how the Far East responded to the rising west some centuries ago. The European profit-seeking ships hitting Chinese and Japanese shores found proud, but navel gazing and arrogant cultures. But during the twentieth century, China and Japan chose very different responses to this competition. China did nothing, its emperor surrounded by corrupt officials who gave bad advice, its dynasty eventually falling apart from civil war and rebellions. Japan, also struggling to shake itself free from a deeply rooted system of rigid traditions, took an entirely different path. It acknowledged that the Western nations were stronger and more advanced than them, but weren’t sure exactly why they were so. They took no chances, and simply copied everything from dress code to imperialism. The countries leaders swallowed their pride, and took advice from westerners, even if the latter secretly mocked them for being an inferior race. In no time, Japan became an empire themselves, occupying much of China. The Chinese, on the other hand, has just recently followed the same template, to such effect that it now challenges a declining west in most areas. Another example is the ascendancy of Turkey after the collapse of the Ottoman empire. The recipe was, at least in theory, very simple; copy the recent success from rivals instead of the old ones of your own. Peter Lim, himself of Chinese origins, has benefited greatly from Eastern Asia’s metamorphosis from lambs to tigers, and should know that recipe. Instead he has used his corporate one, relying on his own success, and surrounded himself with bad advisers for the circumstances. Another metaphor is that he has brought Jamie Oliver to cook a paella in a wok pan using Jasmine rice. It might sell at a restaurant in Singapore, but in Valencia no one will even touch it. No, if the business plan clearly doesn’t work, the best thing to do is to just stop before too much is lost. Valencia is closer than comfort to such a scenario. A bankruptcy in every department than the one it feared so much before Lim came around. Fingers can be pointed at the players, the coaches, the directors, the press and the fans. But there’s only one way the ship can be turned. It’s when the captain realizes he’s hitting an ice berg on the current course, and that he has to turn. Hard. Because as any sailor knows, a poor captain is more dangerous than anything else. But Valencia’s shy owner seems to be a slow learner. It makes you wonder what was really said in those meetings with Prandelli when the latter now says he leaves because he can’t be a part of a ridiculous project (sic). But we will never know for sure what really goes on in Lim’s mind. What does he want with Valencia? Does he really want to make it great again, like he wants us to believe? Or is the 97-year-old entity just an apparatus to make profit from selling on talents? It is safe to say that neither option have been successful so far. But his motives matter a lot to the fans, of course. Valencia fans are generally known to be very demanding. But the former owner and club president Paco Roig, who never shies from speaking straight off his mind, said something interesting in a recent interview with Plaza Deportiva, where he wondered if the fans now have become so disillusioned that they didn’t even bother to protest anymore (he himself resigned after a pañolada at Mestalla). He has a point. Some ultras have manifested their discontent, but the general public hasn’t even taken out their handkerchiefs yet. The reason is probably because they’re confused. To whom do they direct their discontent? Towards the players? They aren’t pleased with Dani Parejo’s recent night club escapades, and they hate to see a team which seem to fall apart every time their goal is threatened. But they all feel betrayed by the man in Singapore, who they welcomed as a hero when he took over the club. Now he’s never present at matches, and is too far away to feel the anguish in the stands. President Lay Hoon is his representative, and would be a natural target for protests. But the permanently solemn-faced executive can hide behind the fact that she is just that; a representative. And why should she really care, apart from occasionally delivering generic company statements to its customers? “We are genuinely sorry you had a less than satisfactory experience with our product. Us at Valencia Club de Fútbol work intensively every day to ensure the customer experience to be of top quality. Thank you for choosing our product”. Statements of this character have often had a soothing effect on the public so far, perhaps because it radiated a sense of calm in the midst of chaos and uncertainty. But it is doubtful it will work for much longer. You just can’t fool all the people all the time. The only question is if the general socios will shake themselves from their stupor to let her know, or fall deeper into resignation. Mr.Lim and the Valencia board might think they don’t need the media, whom they increasingly shut out from the inner workings at the club. But the fans, the embodiment of the sentiment, are more than mere customers. To most of them, the club represents the city and the region, their colours and their traditions. In short, what it means to be Valencian. Many who don’t watch their matches, or football at all for that matter, cares immensely how the club is run. To see it horribly mismanaged without a heartfelt excuse or at least some semblance of interest is seen as an insult to their person. Nevertheless, this fury has not made the owner show his face. In fact, Peter Lim hasn’t been at Mestalla since times were good. At least Malaga’s reckless qatari president shows an interest in his club. But if a furious Mestalla makes no effect in a slick office in downtown Singapore, there’s only one alternative form of protest left for those with a heart for the pride of Valencia; to turn their backs, stop buying club merchandise, and to be absent from Mestalla. Because I’m sure you know, señor Lim, that not even a cold hearted business enterprise can do without their ‘customers’. 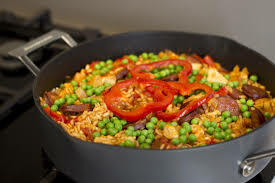 An overpriced rice dish with some bits of chorizo in it might fool a tourist. But it’s not paella. Just like Valencia CF right now isn’t a proper football club, no matter how slick the marketing its wrapped in is.